So what's the one complaint most often levied against the Ford Mustang? How about the lack of Independent Rear Suspension? Guess what? 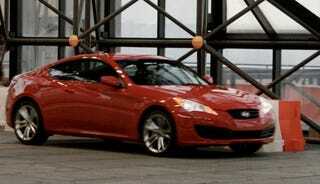 The 2010 Hyundai Genesis Coupe has it. Here's the rest of the details — 212 HP 2.0-liter turbocharged four-cylinder engine or a range-topping all-aluminum 306 HP DOHC 3.8-liter V6 engine. It'll be available starting in the spring of 2009. We'll have many more details shortly and our full gallery of the event in a moment — but yes, it's just been revealed.